Timothy Garton Ash is a formidably well informed and shrewd commentator on international and especially European affairs, but his article in the Guardian on 28 February 2008 laid him wide open to the charges of hypocrisy, ignoring the beam in the west's eye in his enthusiasm for denouncing the mote in Russia's, and perpetuating a kind of knee-jerk anti-Moscow prejudice, a hang-over from the cold war which is badly in need of a quadruple dose of political Alka-Seltzer. It's heartening to see reactions to Mr Garton Ash's piece on precisely these lines in the numerous critical comments appended to it in the Guardian blog, Comment is Free. 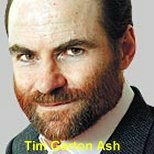 Timothy Garton Ash urges us to spell out to Moscow the terms of closer western engagement with Russia: more respect for the sovereignty of neighbouring states, for human rights and for the rule of law, at home and abroad ('Russia has run rings round the west', February 28). But since Britain has failed to respect Serbia's sovereignty by colluding in the illegal amputation of part of its sovereign territory (Kosovo); has failed to respect human rights by introducing a mass of illiberal anti-terror legislation that includes detention or virtual house arrest for people neither charged with nor convicted of any offence, and permitting UK sovereign territory to be used for illegal extraordinary rendition flights; and failed to respect the rule of law when we participated in armed attacks on Yugoslavia (1999) and Iraq (2003) without UN authority and in breach of the UN Charter, wagging our fingers at Moscow in the way suggested might invite a rather embarrassing retort, don't you think, Mr Garton Ash? Russia is no-one's ideal example of a liberal democracy, but the obloquies constantly heaped on it from the west do seem quite out of proportion to the realities, as well as ignoring the extent to which western policies and attitudes have shared the responsibility for current tensions and suspicions. It's now fairly generally admitted that it was a mistake to saddle Russia, immediately after the collapse of the Soviet Union (itself a by no means unmixed blessing), with a peculiarly crude form of free market capitalism which brought real hardship to millions of Russians and created the régime of the mega-rich oligarchs that we see today. The similar rush to extend NATO membership out to the borders of Russia, including large areas that Moscow legitimately regards as within its own sphere of influence, was widely denounced even at the time as a crass misjudgement, certain to revive traditional (and perfectly understandable) Russian paranoia about encirclement by potential enemies. There's more. The west's attempt to exclude Russia from involvement in the action against Milosevic's Yugoslavia over Kosovo in 1999 was a humiliating failure, depriving the NATO bombing of international legitimacy and eventually forcing the west to seek Russia's help in ending the crisis and allowing NATO to end its destructive and pointless bombing campaign. Four years later the US and UK failed to learn the lesson of Kosovo — that it's both possible and desirable to include Russia in a major international action which affects its legitimate interests — by ignoring Russian and many other countries' objections to the premature use of force against Iraq, by-passing the UN, and going ahead with an illegal aggression whose dire consequences we still live with. On a smaller scale, the UK sought to make good relations with Russia conditional on Russia's agreement to extradite a Russian citizen to Britain in the face of the reality that the Russian constitution forbids any such extradition (would that ours did the same! ), on the face of it an idiotic, because obviously doomed, condition to try to impose. Now we have yet again repeated the same mistake as those in Kosovo and Iraq by ignoring the powerful and well-founded objections of Russia and Serbia (as well as of other regional countries) by going ahead with the active incitement of the Kosovo Albanians to secede illegally from Serbia and precipitately recognising that phoney 'independence' as soon as it had been declared — guaranteeing that the new status is deprived of UN recognition and international legitimacy because of the resolute opposition to it of at least two veto-wielding members of the Security Council. In every one of these cases patient and constructive diplomacy could almost certainly have produced eventual agreement on collaboration with Russia instead of the doomed attempt to ignore and defy her. The resolution of the Kosovo crisis was brought about by precisely such constructive and patient diplomacy — conducted secretly by envoys of the US, Russia and Finland, almost certainly without the knowledge or approval of the Blair government in the UK — producing at least an interim solution which ended the bombing, secured the substitution for the former Serb administration of an international UN-backed administration and peace-keeping force in Kosovo, and gave the settlement the blessing of international legitimacy, all by securing Russian participation. In the words of the song, when will we ever learn? Good work Brian! Well done for highlighting the illegality of our unprovoked attack on the former Yugoslavia. Elsewhere in the Guardian, so-called 'journalists' still use it to justify a policy of 'humanitarian intervention' (a.k.a aggressive war). I have thought a lot about how we got such a big thing [Iraq] so wrong. And I have questioned my own role. After all, I spent eight years being the outsider who said "yes, but …" My alarm bells never rang about Blair's policy on Iraq. I think one reason why is a separate drama that has come back into the headlines this weekend: Kosovo. I saw during that conflict how crucially important was Blair's certainty in what he thought needed doing. Throughout the military campaign there were serious, expert voices saying it could not or should not be done. He was, I think, proved right. That was still a recent memory when he decided his Iraq policy was equally right. I thought at the time that what he had done in Kosovo had set a precedent for justified intervention, and that Blair's judgment was sound. Sadly, being right once doesn't necessarily make you right twice. In fact, though, Blair was wrong twice, not right once and wrong once. It's astonishing that John Williams still can't see it. “… there are two very serious snags about admissions to Nato. The first is the impact on Russia, which remains by far the most important non-western player on the security chessboard. It is by the effect on Russia that our international security strategy should be judged. That is not to say that Russia today is a threat in the same way that we believed the Soviet Union to be a threat; it is not. It is open to us to treat Russia as a normal partner in international relations. The problem is that by admitting to Nato countries that in the past were Russia's friends, or provided Russia with a security buffer, we are likely to be understood as seeking to encircle and isolate Russia, as a glance at the map will confirm. There has been no serious public debate on the expansion of NATO. I wonder how many people in Britain realise that in the event of a conflict between say Romania and Moldova or between Estonia and Finland we would be automatically committed to supporting Romania or Estonia irrespective of the merits of the case. On extradition, our behaviour over the Litvinenko case has been inexplicable. Russia had already demanded the extradition of Berezovsky, both on financial charges and because he publicly called for the overthrow of the Russian government by force. This was an example of the elementary diplomatic mistake of charging into a brick wall. Finally and more diffidently, because personal impressions of a country like Russia are notoriously unreliable, my clearest impression of Russia under Putin (gained during several weeks' independent travel ranging from Archangel to Astrakhan) is that it is a vastly happier place to live in than the Soviet Union, in which I also travelled though not so widely. Brian writes: Thanks for this, Oliver. I had to confine my letter to the Guardian to answering the points in Tim Garton Ash's article: to have ranged more widely (as I'm invariably and usually fatally tempted to do) would have made it too long for the Grauniad to consider publishing it. On NATO expansion and its effects of Russian attitudes to the west, I well remember — although I can't now find the reference — disagreeing in the letters columns of The Times with Bryan Cartledge, former boss and colleague and current good friend, former ambassador in Moscow, when Bryan was advocating further NATO expansion and (with ample justification) denouncing as unacceptable Russian attempts, virtually amounting to threats, to prevent it. I pointed out at the time that once Poland joined NATO, in the event of a (perfectly conceivable) boundary dispute between Poland and, say, Ukraine flaring up and escalating to the point of violence, we, the US and all other NATO members would be obliged under the North Atlantic Treaty to come to Poland's aid, regardless of the rights and wrongs of the dispute — exactly the same point as the one you made but using a different example. My own view is that NATO and its Treaty were made obsolete by the end of the cold war and that a quite different kind of western military alliance, perhaps organically linked (but not of course confined) to the EU, has long been required. NATO's current operations in, e.g., Afghanistan are plainly outside the terms of the Treaty, as was NATO's unprovoked attack on Yugoslavia in 1999 over Kosovo. It's become impossible to define the purpose, scope or limitations of the organization. But replacing it with something more relevant to contemporary needs has been consigned to the Too Difficult tray. As my post above makes clear, I also entirely agree with you about the nonsensical row with Russia over our demand for the extradition of Lugovoi in connection with the murder of Litvinenko. It was clear from the start that Russia wouldn't (and probably constitutionally couldn't) agree to extradite him, and to persist in our increasingly noisy and blustering demands and complaints over this was manifestly self-defeating. The most elementary rule in these matters is never to commit yourself publicly to an objective which you know is unattainable, unless of course you enjoy being labelled a failure. The fact that we ourselves were refusing (probably rightly) to agree to extradite Berezovsky to Russia simply doubled the quantity of egg that ended up on our face. And finally, I absolutely agree that all the evidence points to Russia being a far happier and more acceptable country under Putin than, probably, ever before in the whole of its long history. Why on earth are we not straining every muscle to work in partnership with Russia instead of persistently picking unnecessary quarrels with her, ignoring her legitimate interests, and underrating her continuing power and influence in international affairs? I agree in general with your comments, and those by A.P. and O.M., above. Having looked at the responses to Garton Ash's piece in the Guardian blog, however, I almost sympathize with him: many of the responders do not appear to have read carefully what they were responding to, and have attacked him for things he didn't say or attitudes he didn't imply. Curious how pseudonyms encourage people to write things they wouldn't say to a person's face. Curious, too, the evidently widespread belief that electronic communications absolve the sender from the necessity of proof-reading, and of careful attention to spelling, punctuation, syntax, and the use of capital letters. On the other hand, I did think that a good number of the comments on the Garton Ash article in Comment is Free hit several nails on their heads, even if they were sometimes expressed in unnecessarily extreme language! I would love to start a polemic but I agree with the above. In the Litvinenko case, I found the lying by omission in London the most troubling. It is plainly awful and unjustifiable when a British Citizen, which Litvinenko was, is bumped off in such a horrid way. However, many countries refuse to extradite their own nationals, France, Germany and Portugal among them. And this was somehow never said or explained, either by the British Government or the British media, at least not as far I saw. There was a recent example in France of one young man murdering another. The suspect hot-footed it home to Portugal. Tracked down there, he was put on trial on the basis of French evidence and given the same prison sentence as he would have got in France. If the British Government had opened the door to a similar solution with the Russians, instead of harumphing over the failure to hand over Lugovoi, might this not have been a little more artful and put the other party on the spot? As for Kosovo, given the many wrongs of the past decade, might it not have been a little wiser to keep the status quo going ad infinitem instead of humiliating a revamped and well-behaved Milosevic-less Serbia? Brian writes: I entirely agree with both points. The fact that the Russian constitution bans the extradition of Russian citizens was quite widely publicised in the UK media but it was suggested that the Russians could have got round it somehow if they really wanted to. It was also publicised that the Russians offered to consider any evidence that the UK might care to provide against Lugovoi to see if it justified trying him in Russia but the media (and I think Ministerial) line here was that he wouldn't get a proper trial in Russia and anyway ought to be tried in the country where the murder had taken place. Feeble stuff. On Kosovo, I and many others argued almost to the bitter end that everyone, including the Kosovo Albanians, would gain by further delay in which a compromise solution could have been hammered out — Russian and Serb proposals were not all that far from what the Albanians wanted — but the UN negotiators including Ahtisaari reported that there was no prospect of an agreement and that the existing situation was 'unsustainable' (although this didn't appear to mean much more than that the K-Albanians were fed up, refusing to compromise, and threatening violence unless they got their way immediately). "In constructing a case against the general Western, and the particular British, policy towards Russia I would use rather different building-materials than those employed in your letter yesterday to the Guardian. Nonetheless, we arrive at a broadly similar conclusion, in effect that the Western position is often riddled with arrogance and hypocrisy. (The letter from three MPs that appears above your own in the Guardian of 3 March is an extreme example of it.) In general we exhibit a near total inability to understand, let alone give credit for, the prodigious political feats achieved by the Russians over the years since March 1985 when Gorbachev came to power. The catalogue is breathtaking, but to name just some of the highlights: they rapidly dismantled a vicious and seemingly rock-solid totalitarian system of power that had ruled the roost for seven decades; they achieved a total revolution in their economic and financial systems; they concurred in the dismantling of a politico-military organisation that had enabled them long to wield terrifying military power on a worldwide scale; they acquiesced not only in the dismantling of their empire but also in the loss of a substantial proportion of their sovereign territory; they showed resignation in the face of political humiliation on an epic scale hardly matched, and probably never exceeded, in history. And all of this was achieved virtually without bloodshed. "No one would pretend that the Russia of today is not riddled with injustice and inequality, or would deny that the institutional, social and material legacies of both the Communists and their Tsarist predecessors still weigh very heavily. It certainly cannot be claimed that the system of governance that now operates is a model of open democracy. Of course they are not above criticism, much of it both serious and fully deserved. And yet…. "Since ceasing to live in Moscow in 1986 I have spent a few days there almost every year (with the exception of the four years at the beginning of the1990s, when we served in Oslo) and I have two visits set up for later this year. Each time I arrive in Moscow I am struck by new signs of material progress on the one hand, and a growing sense that at any rate Muscovites are increasingly able to live their everyday lives much in the way that most of the rest of us do in other European or "Western" countries. Putin has brought them much needed and much desired stability and order. It is also understandable, and in the longer run probably healthy, that he is trying to restore a measure of national self-respect. Even if we find the tone becoming strident at times, Western triumphalism and lecturing/hectoring must grate quite as badly in Kremlin ears. He may not have been elected by the strictest of Queensberry rules but, though the point is not capable of demonstration or proof, he probably enjoys quite as much, and possibly rather more, genuine political support as do the leaders of any of the Western countries that so frequently arrogate to themselves the right to offer judgment on the conduct of others. As you know, I have the gravest of reservations about the legitimacy of our own electoral system and in my view, even in this field, arguments about motes and beams, or stones and glass-houses, are very relevant. And in the light of our invasion of Iraq it is beyond belief that people here still have the gall to go on quite so much about the undeniable brutalities of Russian behaviour in Chechnya. "Had the West, especially in its guise as NATO, shown greater political understanding, tolerance and humility we might have continued to enjoy a warmer and more productive relationship with the Russians than sadly is now the case. The general benefits for cooperation over problems in the world at large could have been substantial. History may come to judge us severely for our failures of perception and wasted opportunities." David Ratford qualifies his comment that Russians are increasingly able to live much as we do by the phrase "at any rate Muscovites". This prompts me to add to my earlier comment. Both on the White Sea in the north and down the Volga in the south I saw decent conditions of life, though also some squalor. In both regions Russians told me that "we are the real Russia", not to be seen through the distorting prism of Moscow; not under the Tsars, not under the Soviets, not today. One hears such talk in the outlying regions of pretty well all countries, including the United Kingdom and even England. In Russia I found it not wholly convincing, but oddly heartening. For some reason, current British policy seems incapable of leaving Russians to be Russians. Our policymakers do not seem to realise that if we carp against Russia's leaders, in spite of their overwhgelming domestic approval ratings, and that if we grant asylum to Russia's most wanted men and then make specious demands of Russia to break its own laws, then we are engaging in a policy that is nothing short of wanton recklessness. I really can't see any improvement in Anglo-Russian relations for the foreseeable future; a state of affairs which seems to have been deliberately engineered through stale ideology, disrespect for the nascent Russian democratic process and quite shocking and deliberate disrespect for Russia's laws. If you've not read it, and can get your hands on a copy, I'd recommend Robert Service's 'Russia: Experiment with a people'; a horrifying indictment of what happened in the '90's.